Photographs by Jake Bryant/ Envirofoto.com. Bryant specializes in photographing climate science field research at sites around the globe. 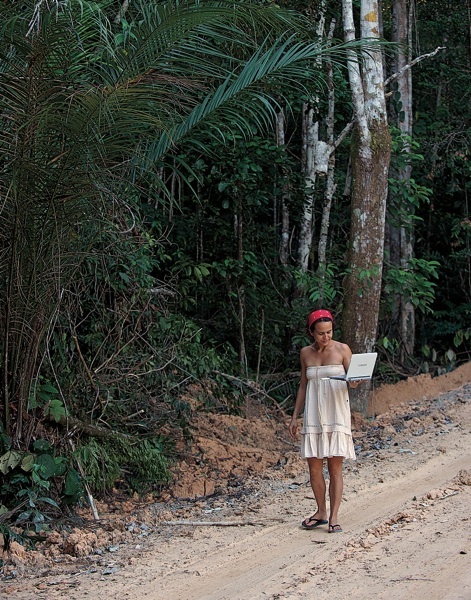 Lissandra Souza at Ducke—even without Internet access, computers are vital field-research tools. Veteran field course instructor Scott C. Stark, a graduate student at the University of Arizona, explains the use of equipment for measuring photosynthesis. 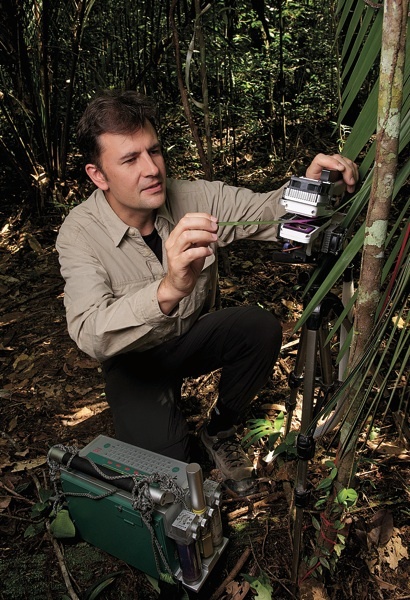 Professor Paul Moorcroft measures photosynthesis in an understory palm. 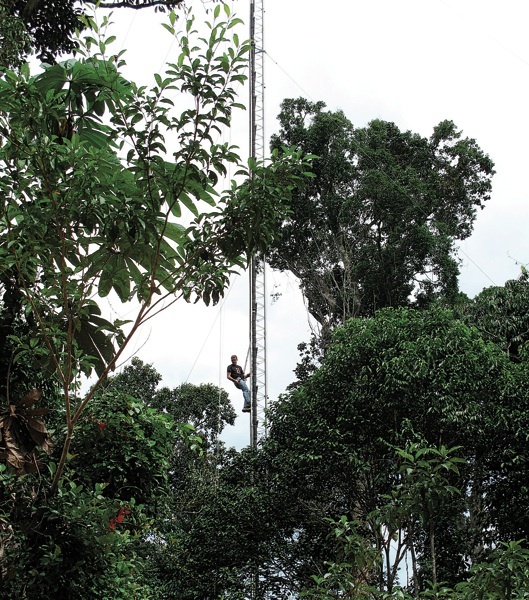 Robert Newell climbed carefully, hand over hand, up the side of a 14-story meteorological tower in the middle of the Amazon jungle. A pulley at the top had jammed. For more than an hour he’d been clambering up and down the metal structure, installing flexible plastic tubing at heights of 5, 10, 20, 30, and 40 meters--part of the preparations for an experiment that would begin sampling atmospheric carbon dioxide (CO2) and gathering weather data that evening. He and some of the other students enrolled in Earth and Planetary Sciences 74 (“Field Experiences”) were scheduled to stay awake all night to do the work. Newell and his fellow students--in all, two undergraduates and 18 graduate students from several American and Brazilian universities, working with scientists from both countries---were experiencing firsthand the gritty practical challenges, large and small, of doing science in the field. Their research, meanwhile, was demonstrating how getting the small things right can bear profoundly on a huge problem: understanding how global climate change will affect the Amazon. Just getting to the research station--in the central Amazon basin about two hours’ drive from the city of Manaus--had not been easy. Eleven days earlier, after visa complications forced him off one flight, Newell had flown from Denver to Atlanta to meet the other American students and instructors in the field course. From Atlanta, they flew to Manaus, a city of two million with few roads connecting it to the rest of Brazil--the one unbroken highway leads north to Caracas, Venezuela, more than a thousand miles away. The practical way in or out is by boat--a 900-mile trip on the Amazon River--or by plane. The students landed after midnight, withdrawing Brazilian reals from airport ATMs so they could purchase mosquito netting and hammocks (redes, pronounced “hedgies” in Brazilian Portuguese) at the local market the next day. Once in the jungle, the students would have no use for cash. 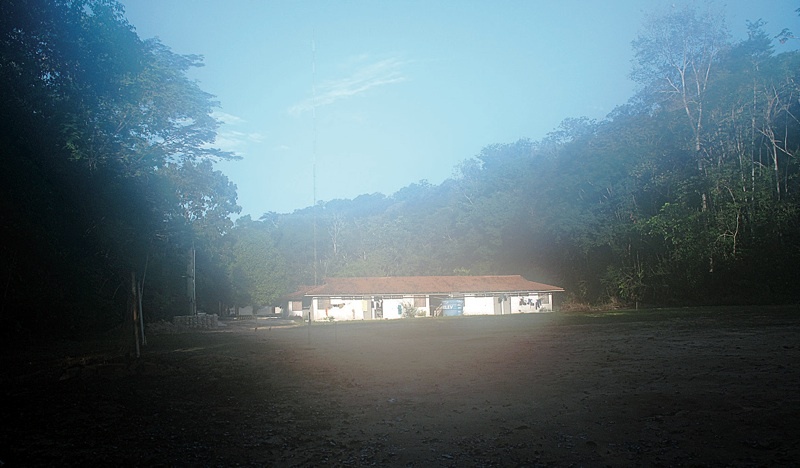 From Manaus, the group was driven about 30 kilometers to the Ducke base camp, a rainforest research reserve run by an agency of the Brazilian government. There they spent a hands-on week learning field-research methods: for example, how to operate the scientific instruments that gather data on the complexities of gas exchange among plants, the soil, and the atmosphere. Language barriers didn’t hamper communication much: the Americans learned the rudiments of português brasileiro, while their hosts got a chance to practice English. In the second week, they split into four groups, each focused on its own project. Marcos Longo, a Harvard graduate student from Brazil who typically works with mathematical models of ecosystems, joined a group that left for a patch of intact forest surrounded by abandoned pasture, to study differences in emissions of volatile organic compounds between plants growing at the rainforest’s edges and those found at its center. “For me, the Amazon was a bunch of numbers on a computer screen,” he said, when thinking back on his relationship to his subject before the course. “This was a great opportunity because it raised questions about things that make sense on your computer, but that--when you get to the forest--make you realize, ‘Well, it is not quite like that.’” A second group studied differences in the photosynthetic capacity of two species of understory palms around Ducke: one common in deeply shaded lowlands, the other more prevalent in montane habitat. 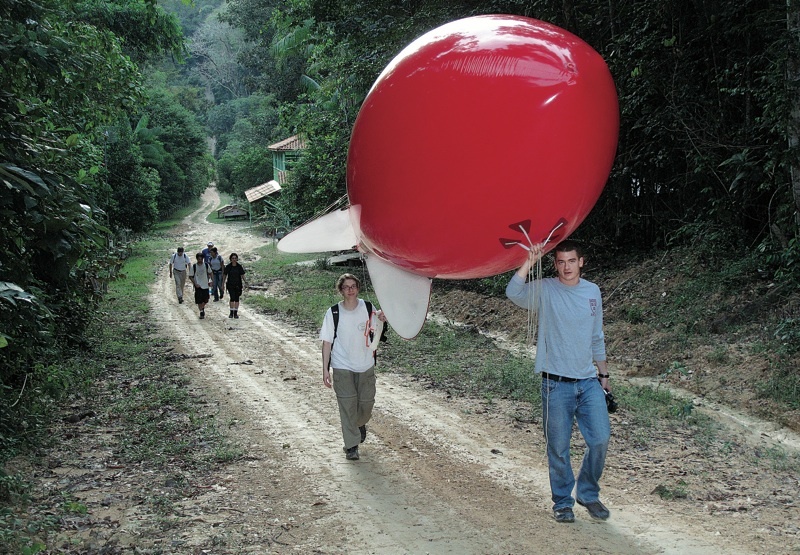 Harvard graduate student Matthew Hayek, an atmospheric scientist originally trained in physics, joined the third group, measuring the natural rate of emission of the powerful greenhouse gas nitrous oxide from rainforest soil in order to establish a baseline that would help researchers distinguish anthropogenic sources of the gas. The fourth group, including Newell and Hannah Horo-witz ’11, a concentrator in earth and planetary sciences, set out for research site ZF-2 to learn how to measure the rainforest’s uptake and release of carbon, and how to link information about forest growth to meteorological data. 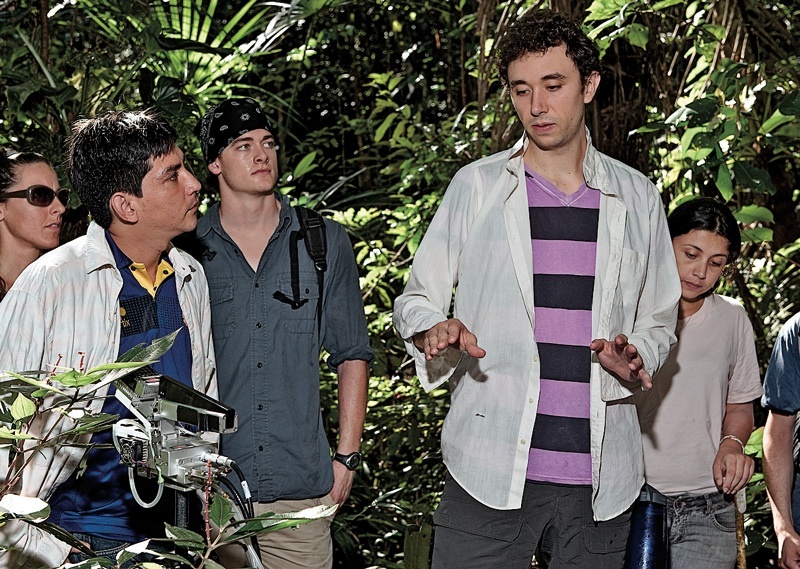 The students soon learned that researchers in the Amazon must contend with much more than high humidity and heat. Travel on local access roads can be tricky: their clay surfaces are slick when wet, so professional drivers in four-wheel-drive vehicles handled transportation. And because the forest itself is dynamic--trees grow and die rapidly--it is not uncommon to find a vine-shrouded trunk in the way that must be cleared with ax and machete. As a precaution, the students were required to be immunized against typhoid, yellow fever and hepatitis. They carried anti-malaria medications and doused themselves in insect repellent to avoid getting mosquito-borne dengue fever (for which there is no vaccine) and leishmaniasis (a potentially disfiguring disease carried by the local sandflies). Snakes are common in the forest and also turn up in camp--a venomous one was killed by members of the camp staff outside Horowitz’s cabin one morning--so everyone was instructed to wear ankle-to-knee snake gaiters. They dusted their ankles with sulfur dioxide to deter pesky chiggers, and trod carefully to avoid stepping on tarantulas, centipedes, or scorpions. Newell, who at first had trouble sleeping in a hammock, awoke on his mattress on the floor one night to the sensation of stinging in his back: he was covered with ants. (He got used to the hammock.) He also spotted a wild boar, larger than a pony, one day on a side path, while out walking at ZF-2 with Rafael Tapajós, one of the Brazilian students. Such boars frequently travel in packs, trampling everything in their path. This one, fortunately, was alone and tuskless. The camp dog was less lucky: he’d lost an eye to a jaguar the month before. The students, enrolled at Harvard, the University of Arizona, the Universidade de São Paulo, the Universidade Estadual de Campinas, and the Universidade Federal do Oeste do Pará, had come from the United States, Mexico, the United Kingdom, and Brazil as part of a U.S. National Science Foundation- and Brazilian government-funded Partnership in International Research and Education (PIRE) program. PIRE projects are designed to train and educate students in international research collaborations. This one, now in its third year, is organized by the University of Arizona and run jointly with Harvard to focus on a very important question: what will become of the Amazon rainforest under climate change? Wofsy showed the students at ZF-2 how to make vertical profiles of the atmosphere below and above the forest canopy: measuring temperature, humidity, pressure, wind speed and direction, as well as the concentration of atmospheric CO2. Such measurements allow scientists to link meteorological conditions to rates of respiration and long-term plant growth. Because the students would be collecting data all night, they spent the day in preparation. While Newell worked on the CO2 measuring equipment on the tower, the other students--Horo-witz and Brazilians Kenia Wied-emann, Tapajós, and Bernardo Flores--learned to calibrate and operate the sonde suspended beneath the balloon. (Like an instrumented weather vane, the sonde gathers meteorological data and beams it wirelessly to a computer at the base of the tower.) Raising the balloon right next to the tower would allow them to integrate the weather and CO2 measurements. The students tested the winch that raised and lowered the balloon, running numerous practice flights; small mistakes were made, such as forgetting to turn on the sonde’s power or the light that lets the researchers keep track of the balloon in the darkness. They also had to monitor the wind speed above the forest canopy carefully. 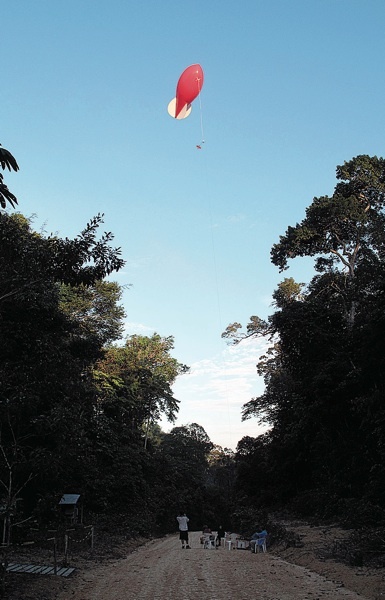 Although there is little or no breeze at ground level in the rainforest, above the treetops the night winds can blow briskly at five or more meters per second; the lightweight weather balloon could easily be blown into the nearby trees, ending the experiment before it had even begun. Before nightfall was the time to iron out potential problems. Fieldwork requires real versatility--careful preparation, the creativity to solve problems of all kinds, doggedness, and the will to work long hours. The wilting heat made everything harder. During the day, little had moved except the researchers: a blood-sucking leech inching across the road, a meter-long earthworm writhing nearby, and army ants streaming by busily in double rows. By late afternoon, when the students finally finished their first set of tasks, their day was still not over: there was an entire suite of additional technical skills to master--necessary for handling the data, which was gathered on floppy disks (almost a Stone Age technology to these young students)--as well as the next day to plan. During a break, Wofsy taught them the rudiments of “R,” a programming language in which he quickly wrote a script to extract the data from the floppies. At 6:15 p.m., just past sundown, the bats came out. Tapajós raised the balloon to 60 meters, then 80, then 100. From the base of the tower, Horowitz called out the wind speed: “Four meters per second, 4.5, 5.2.” After all the preparations, there was excitement in the students’ voices. “Relative humidity 87 percent, temperature 24.81 C, pressure 990 millibars.” After taking CO2 measurements at 8 p.m., the group broke for dinner, returning at 10, when the air was hazy and thick with moisture. Lightning flashed on the horizon. They took more CO2 measurements at 11 and midnight. But the next reading was negative--an impossibility that indicated the equipment was no longer working properly. Then the device shut off completely. Unable to do anything about that, they continued the meteorological observations with the balloon. Around 1, the atmosphere cleared, and the star formations of the Southern Hemisphere appeared, a breathtaking sight. Under Wofsy’s supervision, the students passed the time between readings laughing and joking, making lots of noise to frighten off wild animals. Wofsy told of how a low-flying plane had once passed under one of his balloons, narrowly avoiding the wire tether. He later learned that the pilot had reported seeing a UFO. Wofsy himself has been doing fieldwork since the 1970s, when as an associate professor he studied greenhouse-gas sources in aquatic systems, visiting the Delaware and Potomac rivers--outfalls of urban Newark, Philadelphia, and Washington, D.C. His first trip to the Amazon, in 1983 aboard Jacques Cousteau’s Calypso, involved a similar program of study. He now runs several research sites that have tracked carbon uptake in forests around the world for two decades. (The biosphere sequesters about a quarter of all human-generated CO2 emissions, mostly in mid-latitude forests). The Amazon is of particular interest because recent climate-model simulations have predicted that this tropical rainforest ecosystem--home to the greatest variety of living things on the planet--may collapse by the middle of this century and be replaced by grasslands, taking its extraordinary biodiversity with it. Transformation of the rainforest into a savanna would not only lead to the extinction of tens of thousands of species of plants and animals that exist nowhere else, but also severely harm the Brazilian economy: the Andes-Amazon region is the world’s largest river basin, and the source of one-fifth of the earth’s fresh water, providing hydroelectric power to coastal cities like São Paulo and water for irrigation to the vast agricultural region of Mato Grosso. (Brazil is the world’s largest exporter of soybeans, and the second-largest exporter of beef.) Loss of the rainforest might even dry out the entire South American continent significantly. Training the next generation of scientists to help figure out what is happening in the Amazon is therefore of great importance. The predictions of potentially catastrophic drought have drawn the attention of the Gordon and Betty Moore Foundation, which runs an Andes-Amazon initiative seeking to maintain the ecological function and representative biodiversity of the Amazon basin. The foundation has spent millions acquiring biodiversity hotspots in the region to prevent them from being deforested (mainly by cattle ranchers), but even that strategy will fail if the climate-change predictions for the region are accurate--and so the foundation began pondering the stark possibility that the Amazon basin might dry up. Two years ago, the foundation turned to Wofsy’s colleague Paul Moorcroft, professor of organismic and evolutionary biology, an ecologist, and asked him to determine if the most widely used climate-change model’s predictions of Amazonian savanna-vization were correct. Moorcroft studies the long-term dynamics of terrestrial ecosystems: working with empirical data painstakingly collected from small-scale, intensively studied ecosystem sites, he plugs the data describing what is known about how different types of plants grow and compete with each other under various environmental conditions into a model. Then he uses mathematical approaches to formally scale up this information, both in time and space, in order to describe the behavior of entire large-scale ecosystems across decades or even centuries. This approach is very different from how ecosystems are represented in current climate-change models (which originated with global-scale computer models of the weather first developed in the 1980s). The latter represent ecosystems by dividing the earth into grid cells that typically cover two degrees of longitude by two degrees of latitude--equivalent to tens of thousands of square kilometers--and treat everything within that area as a single plant. It is these older, so-called big-leaf models that predict the drying out of the Amazon rainforest by the middle of the century. But as Marcos Longo, a graduate student working with both Moorcroft and Wofsy, points out, “When you treat a complex ecosystem like the Amazon as though it were a large green carpet, heterogeneities are lost.” Furthermore, big-leaf models can’t easily be linked to actual, detailed data--about forest growth, carbon uptake, and local weather--of the kind that Wofsy has gathered for decades. Moorcroft has worked extensively with Wofsy’s data from northern temperate forests and developed an “ecosystem dynamics” model that accurately predicts forest growth not only at the site for which it was developed, but also at other sites in North America with different mixes of conifers and hard- and softwood trees. 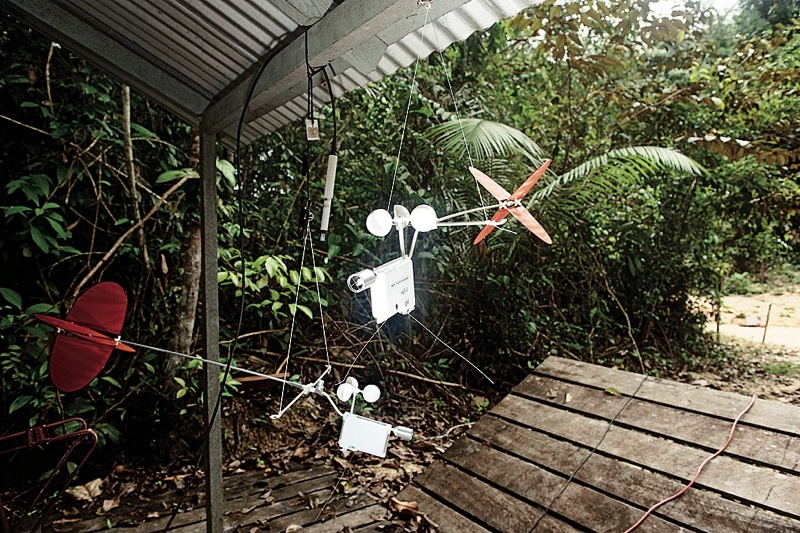 Although he does most of his modeling work at Harvard, Moorcroft frequently visits the Amazon and other rainforests, where he has begun setting up meteorological data-gathering stations. Field-course director Scott Saleska, a Wofsy postdoctoral fellow before moving to the University of Arizona, invited Moorcroft to Ducke to speak to the students about how his modeling work can be used to improve the analysis and collection of empirical data. Moorcroft showed the students how his ecosystem dynamics model, calibrated using just two years of species data from the Harvard Forest, could accurately predict a decade of growth in several different mid-latitude forests, when observed meteorological data (e.g., rainfall, sunshine, temperature) were plugged in. His model can approximate forest growth from Connecticut to Canada--but can he develop one that describes the ecosystem dynamics of the Amazon? Perhaps 25 species of trees live in a northern temperate forest: most are deciduous, with a few conifers, all clustering in favorite habitats. The ecosystems of the Amazon basin are vastly more diverse and the trees have different characteristics than their northern counterparts. The soils are poor, with most of the nutrients in the living ecosystem rather than in the soil. The seasonality alternates between wet and dry, rather than hot and cold. And under current climate conditions, moisture is not a major limiting factor on plant growth. In order to develop a credible prediction for the Amazon’s fate, Moorcroft explained that he needs to know how different species within the forest react to a given change in the environment--a drought, for example. To that end, he told the students, he is incorporating data from a two-year-long experiment that excluded water from a hectare-sized research site in the Tapajós National Forest near Santarem, Brazil--using an elaborate system of panels, gutters, and drains to prevent rainfall from reaching the ground--to see how the forest responds. 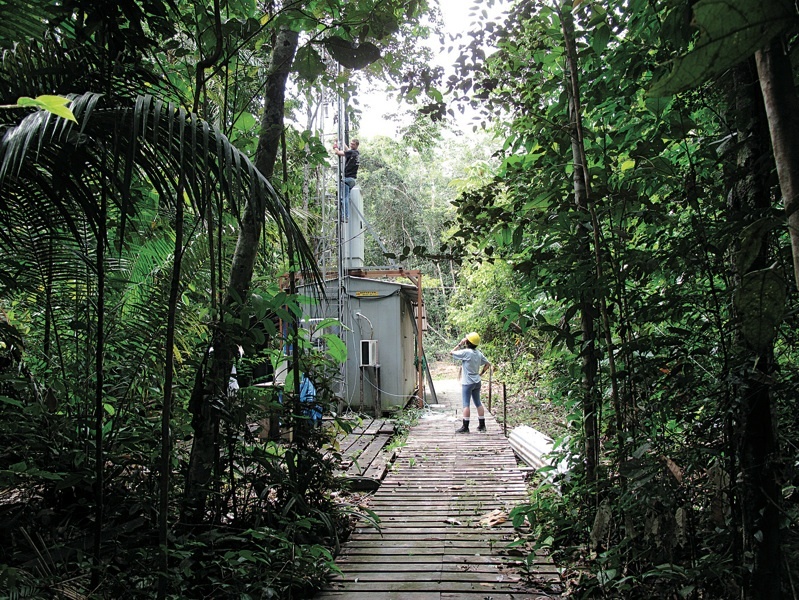 During the next two years, his team will use the measurements from the site to construct a quantitative model that describes how the rainforest’s behavior and composition change under these experimentally imposed drought conditions, and then test the model against data from an eight-year drought experiment at another tropical forest site several hundred kilometers to the north. They will then use the calibrated model to gauge the likely regional-scale impacts of drought stress in the Amazon during the coming decades. Support from a generous gift for international reporting enabled managing editor Jonathan Shaw ’89 to travel to Brazil to research this article.